Put your awareness into the center of your head. Imagine a big golden sun, and call back all your energy into that golden sun. Once you’ve collected up all your energy, allow the golden sun to flow through the top of your head, through the center of your head, and fill up your entire body. Do you feel a change once you’re grounded and filled with your own energy? Now, about eight inches from your forehead, get an image of your favorite flower, or maybe a bubble, or a miniature sun. Can you sense it? Can you feel it? Now release this image, and create another one- it could be another flower, or bubble or sun, or you could experiment with something different. Now release this image, just let it go, let it float away. 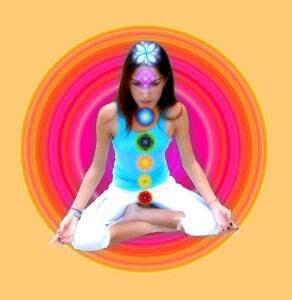 Notice the center of your head, notice the space around you, find the edge of your space, your aura. Notice you can also use your grounding cord to ground your aura. Now, in front of you, get another image of a flower, or bubble or sun, but this time, with the idea that this image represents you, on an energy level. What does this image look like? Is it vibrant or dull? Solid or wilted? If you don’t like it, release it and make another- just do this until you get something you like. Now set your image on the edge of your aura. Allow it to be between you and all the energies around you. Allow it to provide some separation between the demands and expectations the world has of you. Get a sense of your job- let it be between you and your job. Get a sense of a person you work with- let your image be between you and this person, giving you space. You can even use it to give yourself space from your family. As you find your separation from the things around you, you create more space for yourself. This space gives you the freedom to be you, to enjoy your own energy and ideas. Think of something you are supposed to be doing, a task, and allow yourself some space from it. How does that feel? Allow your image to remain at the edge of your aura. Once you’ve found a sense of separation, create a golden sun, and fill yourself up. As you fill up, get a sense of owning your space, and owning your ability to be separate from the energies, expectations, people and things around you. Download the video and MP3 instructional package, for Meditation Class Four. It is enhanced with sound therapy techniques to deepen your meditation experience.